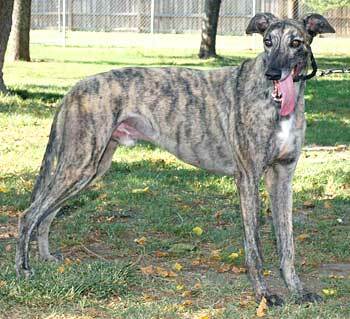 Tanner, aka Lite Brown Sugar, is a 3-year-old, brindle male born on November 20, 2002. 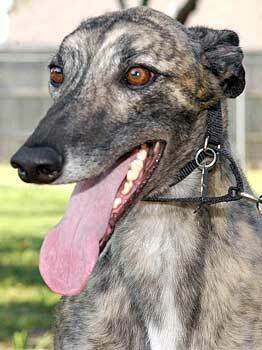 If blue-bloods exist in the Greyhound world, Tanner is a charter member as his lineage boasts multiple famous sires. Tanner's dam is Bent Lite and his sire is Dominator, a well-known racer and still active sire. Tanner's grand daddys are the famous Molotov and Raising Cain, and two of Tanner's great great grandsires are HBs Commander and He's My Man. All told, these sires have produced a total of 16,179 Greyhounds between them. 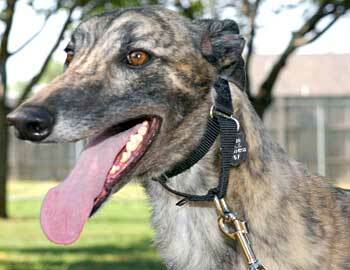 Tanner started his racing career in La Marque, TX, where he competed at the Gulf Greyhound Park. After Gulf, Tanner raced a bit at Valley Race Park outside of Harlingen, and decided to call it quits after his 70th race. He is now ready for his new job as a favorite pet. Tanner may have lots of connections in the racing world, but it is his heart and soul that will put him in first place with his new family. Tanner is cat trainable. Tanner is a sweet, funny boy. He has good house manners. He has shown some interest in the kitchen counters, but with a No! and a squirt with a water bottle, he loses interest. He is a cutie with ears that flop forward and a fun-loving personality. He loves to go for walks and walks well on a leash. He LOVES toys and will play and carry one that squeaks around in his mouth. We can also get him to play with us; he will jump and run around. He makes us laugh at his antics. He plays hard then sleeps hard. He also likes to get scratches and petting. He does not mind going into his crate, especially after you toss a treat in. He will go in and lay down. He likes treats and is a good eater. He did show some interest in our cats when he first came into our house, but pretty much ignores them now. He will lay quietly on a dog bed or the floor in a room with you and he sleeps all night on a dog bed in my room. He will go to the door and whine to let you know if he needs to go out at night (which is not very often). He fluffs his bed once in awhile to get comfortable. Tanner does not seem to be afraid of anything. You can vacuum right up to where he is laying and he will just lift his head and look at you. We had to physically drag him out of the way and he did not mind that either. Too funny! What a boy! Tanner is a joy and fun to have around. If you are looking for a very cute, very playful, happy-go-lucky and very sweet greyhound, Tanner might be just the dog for you.